P. 383 x 274 mm., S. 535 x 410 mm. 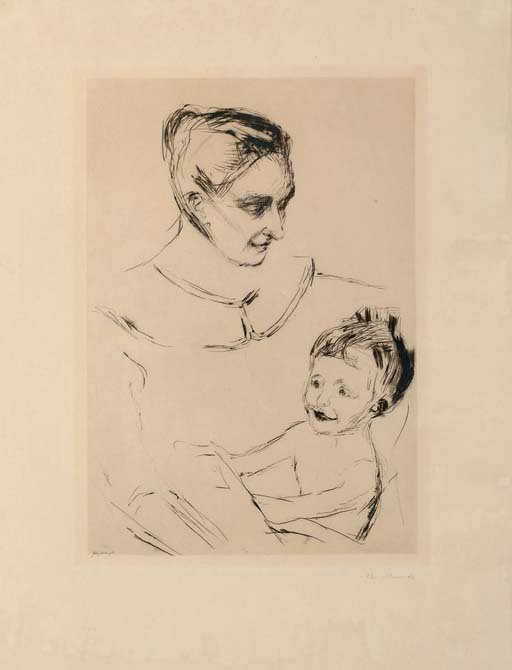 A Mother's Joy is a portrait of Dr. Max Linde's wife Marie and the youngest of their four sons, aged two. Dr. Max Linde was an opthalmologist in the nothern German city of Lübeck and collector of modern art. In 1902 he became aware of Edvard Munch and within less than a year he had acquired almost the entire printed oeuvre of the artist up to that point. His admiration for Munch was such that he invited the artist to stay in his beautiful, classical villa in Lübeck in order to produce a small series of prints, portraits of his family and views of the house and the large gardens surrounding it, the so-called Linde portfolio or Im Hause Max Linde. The plates were printed 1906 and the portfolio was produced in a small edition of 13 only. The present impression and the following lot are part of the portfolio and come by descent from a member of the Linde family.